This week’s installment of 3 on a YA Theme is sponsored by the Book Riot Store. Build your bookish wardrobe! Buy any tee and get socks free this week only. Raise your hand if you’ve rolled your eyes or sighed at the news of another celebrity getting a YA book deal (raising mine). Raise your hand if you’re still waiting for celebs like Tyra Banks to finish the series she began years ago and never completed (…this one might be me and only me, even though I never read the book — I simply love the fact she wrote a book with a main character named Tookie De La Creme). We could keep on about the celebrities who’ve gotten the opportunity to write YA books and publish them with tremendous publicity behind them, but I don’t think it’s a particularly interesting or worthwhile conversation. It’s expected. Instead, I think it’s way more fun to talk about the celebrities we’d love to see write a young adult book or two. Here are three of my picks for famous people I want to read a YA book by, along with why they’re on my short list. I want to hear your picks down in the comments, too. Maybe if we’re loud enough, we’ll see our wishes come true. Technically, Amandla has published a book for young readers. It’s a comic about a young black warrior girl and you can read a little more about it here. 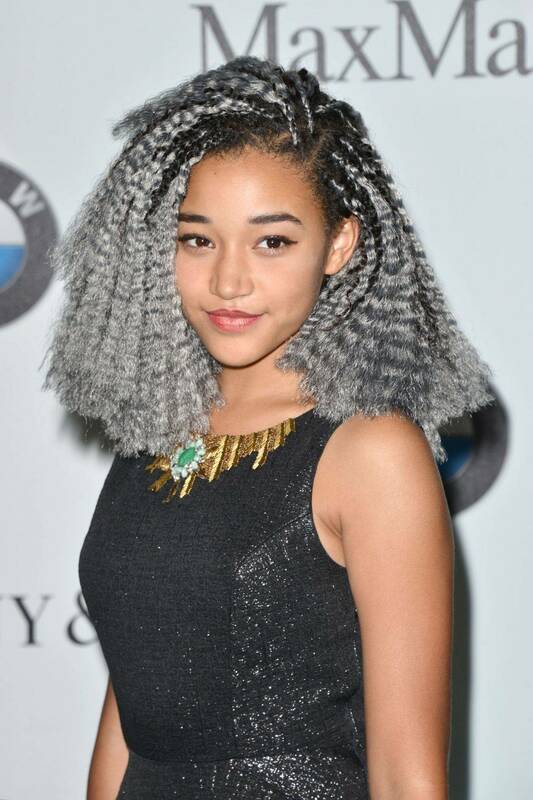 For those who might not be familiar with her, Amandla played the role of Rue in the adaptation of The Hunger Games. She herself is still a teenager, and over the last year, she’s really spoken up and out about being a young black woman. She’s passionate and engaged in the current culture. I don’t know if I have any specific type of book I’d love to see from her, but I suspect her voice would be powerful in a memoir for teen readers, as much as it would be powerful in a novel. Perhaps with her experience in Suzanne Collins’s megahit, she’d be a great author of a dystopian novel. Or maybe she’d write a killer space story — the idea of black teen girls at the helm of a spaceship is one I’d love to see and Amandla might be the right writer for such a story. This Golden Globe Award winning actress starring in Jane the Virgin would be an excellent YA author both because of her role in the show and because her voice and experiences would speak to so many young readers. She hosted the Teen Choice Awards last year, so she’s already in the eyes and minds of the target YA readership. There are so many types of novels that Rodriguez would be great at writing with her background. But I think if I were to take a guess at what her forte would be, it might be romance or romantic comedy. Perhaps she’d write a politically-leaning romantic comedy or one which takes place in a church (which suddenly sounds like it would be a really amazing novel set in a short time frame). Best known for her role as April on Parks & Rec, it’s really her role in the small, ’90s set teen comedy The To-Do List that makes me think she’d reach the YA audience quite well. The film is about a girl who just graduated from high school and wants to get more sexual experience before college — and she does it by keeping track of what she does and how far she goes. It’s cringe-worthy and funny and Plaza does a great job in it. The film’s story isn’t far off from what I envision Plaza herself writing. She’d create a funny, perhaps irreverent, teen girl fumbling her way into making sense of her life and the world around her. What I’d love to see from Plaza in a YA novel would be something dark, even bleak, but with a main character who finds the humor in it. I’d love to see a touch of romance, but the kind of romance that isn’t traditional. Think Andy and April style, where a trip to an abandoned house is considered a sweet date. Now spill yours! Which celebs do you want to write a great YA novel?